Inktank’s embossed business cards bring you a striking, stunning and sophisticated 3-dimensional fashionable look and feel by the way of pushing your logo or lettering from the back of the card, resulting in a polished raised surface on the front. We can print both an embossed and debossed look for you at the one time, and debossing is essentially a result of the of the embossing on the reverse side of the paper stock. 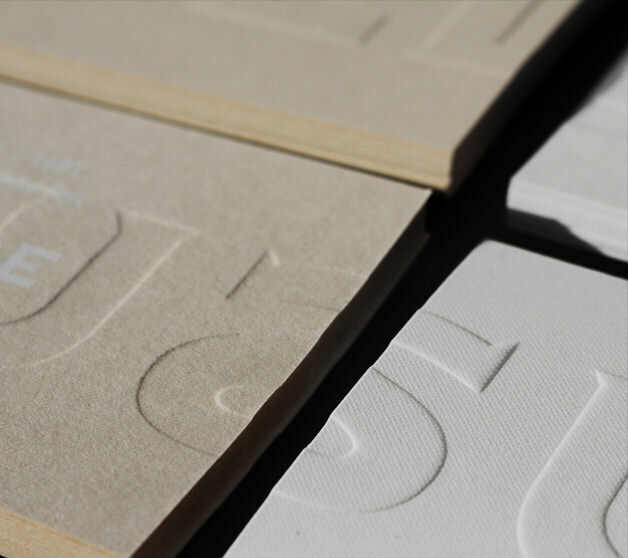 The emboss process is a delicate one, and paper textures and thickness all affect the outcome. Please speak with your Inktank specialist today to assist you in deciding upon the ideal paper solution. Accentuating your business details and brand, this print technique works magically when applied on one of Inktank’s good quality and specialty textured papers. The process itself involves your design being pushed from the other side of the business card to present you with an elevated surface on the front. The print technique is different from raised ink printing because the latter still has a smooth and flat surface on the back whereas embossed printing has an emboss/ deboss mark on both sides. Debossing recesses the design rather than raising it, resulting in an indented impression that is brought about when pressure is applied to the front side of the paper and forces the material down from the surface. What is embossing? Embossing is where the surface of the card is raised, accentuating natural shadows and bringing a real-world feature into your design. The process involves two opposite etched metal dies and heat working together to push the images or text above the surface of the paper. Emboss & deboss are both techniques used to imprint impressed or depressed designs onto paper. You must ask yourself, do you want to deboss – have an indented impression in the paper or do you want to emboss – raise the design to create a 3D impression. Now it’s time to make the next important decision – blind printing or a touch of colour? Blind debossed or embossed business cards is an imprint without ink or foil applied, leaving the design as is or you can fill the indentation and raised surface with ink or foil. Go ahead and engrave your brand in consumers minds!